Delicate and dainty, “skinny band” engagement rings have become incredibly popular. These engagement ring designs contrast an ultra-thin band (less than 2.5 mm wide) with a sizeable, sparkling solitaire center stone. Before committing to the skinny band engagement ring trend, however, there are a few style and design guidelines that should be followed to rock this popular look. Not every diamond size and shape can be dropped into a skinny band, and certain details and accents are limited for this minimalistic style. Skinny bands are the opposite of bold and big, but what they lack in size they make up for in understated chic elegance. Skinny bands showcase a solitaire diamond or gemstone better than any design. Less metal means that the diamond or gem pops perfectly and remains the center of attention. A skinny band can make a small diamond look big, and a large stone look massive. The average carat for a diamond engagement ring is .75 carats, which is a great size for thin engagement rings. While it might be tempting to go for that higher carat, be aware that skinny bands can be overwhelmed by a diamond over 2 carats. Depending on the cut and setting, the diamond could easily cover most of the band on your finger, which defeats the purpose of that fine-lined look. It’s all about finding the right balance. You don’t want your stone to completely overshadow your beautiful skinny band, but you also want your diamond to shine. If having a lot of bling is high on your list of “must haves,” opt for a smaller center stone with a halo setting, or even a solitaire with a skinny eternity band, like those pictured below. These two rings feature the same petite pave band, but with a .5 carat center stone (left) and 2 carat center stone (right). Both also feature an emerald cut, an elongated cut that will make a diamond appear larger than it is—a smart choice for budget-conscious buyers. 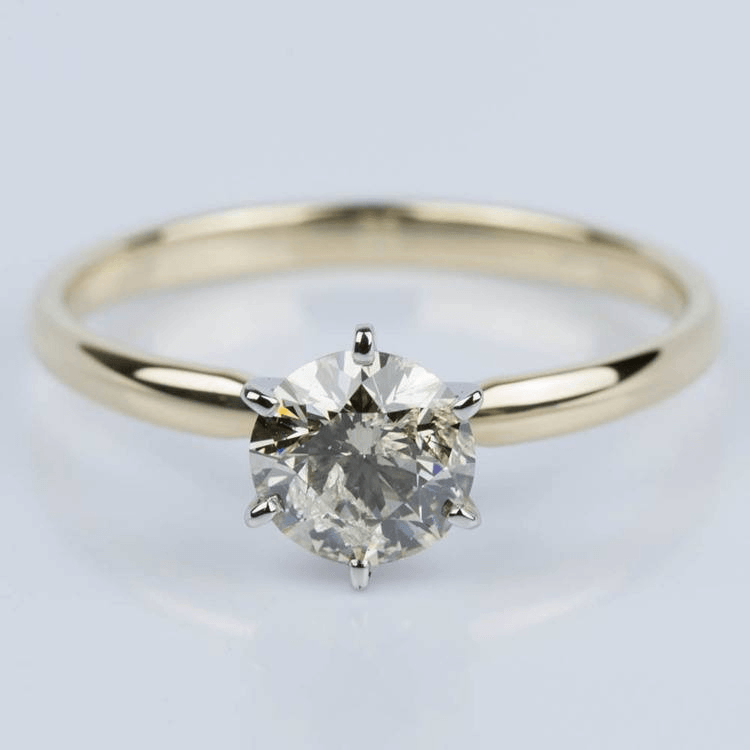 In skinny band engagement rings, the center mount is very important. With a thin band comes less metal to anchor your center stone, so you need a mount that offers good support. Prong settings, particularly a six-prong setting (like the one pictured below), offer the most protection. Take extra precaution with diamond shapes that require more prongs to protect delicate tips—like marquise and pear shapes. Prong settings also have the added benefit of allowing more light to reach your diamond, unlike the highly-secure bezel setting. The beauty of the skinny band engagement ring is in its simplicity, so keep away from heavy accents or motifs. This band is simply too small for any intricate engravings; twisted, curved, or split-shank bands also detract from the minimalist beauty. Halo settings: A unique shape like a square (or even octagon!) halo makes a big statement, while a “hidden” element like a drop halo, where the halo can only be seen from the side of the ring, adds style without adding “weight” to the ring. 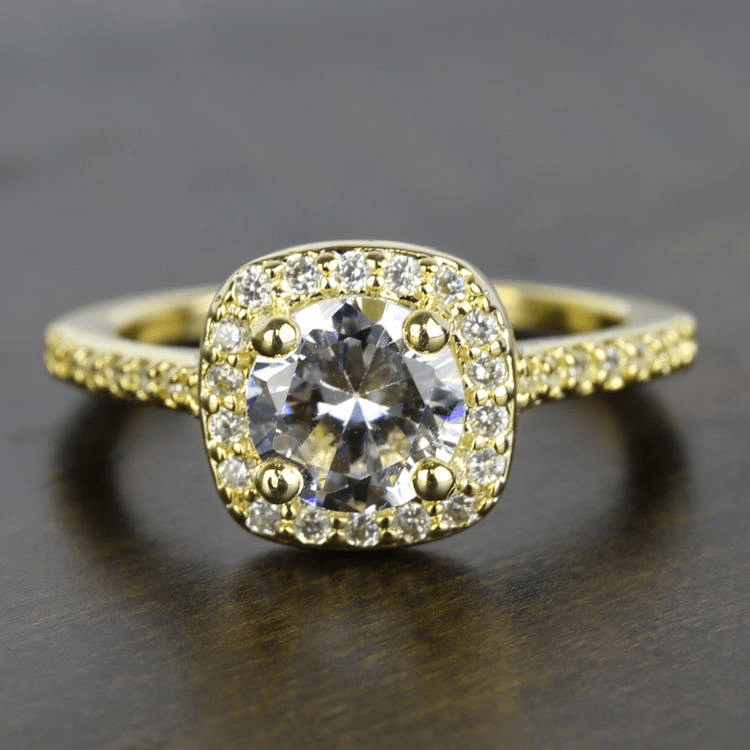 Another way to get a vintage look is to do away with diamonds entirely! Diamond polishing technology was not always as advanced as it is today, so gemstones were often the top choice for pre-twentieth century jewelry. Sapphires and rubies are popular gemstones, while “fancy” diamonds are available in multiple shades, including pink, blue, black and red. The most common fancy diamonds you see today fall on a spectrum of light yellow to dark brown (pictured above, right). Pair it with a dainty wedding band. While you can pair a skinny band engagement ring with any wedding band, this style usually looks best with other skinny bands. When choosing your wedding band, keep the width to a similar measurement of your engagement ring band. This ensures a more harmonious appearance. You can also buy a curved band that will hug the line of your engagement ring so you maintain a streamlined look. Skinny band engagement rings incorporate chic minimalism for a romantic and delicate engagement ring design. These rings embrace the ‘less is more’ approach to style, and while these rings may be more diminutive in size, their understated elegance will stand the test of time and the fads that follow!